New Materials Add Strength to Veneers' Beautiful Life-Likeness - De Pere Family Dentistry, L.L.C. By De Pere Family Dentistry, L.L.C. With exciting innovations in cosmetic dentistry over the last few decades, we can now transform nearly any unattractive smile. One of the best and most cost-effective of these is the porcelain veneer. These thin layers of dental porcelain are bonded over the front of chipped, slightly misaligned or stained teeth to create an entirely new look. Veneers have evolved over time, especially with the materials they contain that give them their beauty and life-likeness. The first veneers were made mainly of feldspathic porcelain, a mineral composition known for its similarity in color and translucence to natural teeth. But because this early porcelain had a high amount of silica (in essence, glass), and because they were created through overlaying several thin layers that weren’t as strong as a single piece, they were prone to shattering. This made them problematic for teeth subject to heavy biting forces or patients with clenching or grinding habits. The situation changed dramatically in the 1990s, when dental labs began adding Leucite, a sturdier glass-like mineral that didn’t diminish the porcelain’s translucence. Not only did Leucite make veneers more shatter-resistant, it also enabled dental technicians to fashion most of the veneer in one piece to further strengthen it. More recent veneers may now incorporate an even stronger material called lithium disilicate. 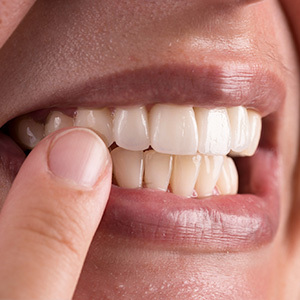 Because lithium disilicate has twice the strength of Leucite, veneers made with it can be as thin as 0.3 millimeters. Not only does this blend together the most desirable qualities expected of a veneer—strength, aesthetic appeal and easy fabrication—it allows for a broader range of situations and uses. Both of these materials can be pressed or milled to assume the exact shape necessary to fit a particular tooth. The manufacturing process also allows for creating smaller veneers that can then be overlaid with porcelain for the most life-like appearance possible. Thanks to these stronger materials enhancing the natural beauty of porcelain, we now have a wider creative palate for transforming your smile.